COLOURFAST FIRE RETARDANT & ENVIRONMENTALLY FRIENDLY The fire retardant, pine wood chip comes in a variety of colours, including our most popular shades of Sunburnt Red and Ash Black. The UV-protected dye coating is fade resistant and long lasting, even in Australia’s famously tough climate. Perfect for businesses, especially large-scale projects, Vivid Mulch will add sophistication and intrigue to every garden. COLOURFAST, FIRE RETARDANT & ENVIRONMENTALLY FRIENDLY The fire retardant, pine wood chip comes in a variety of colours, including our most popular shades of Sunburnt Red and Ash Black. The UV-protected dye coating is fade resistant and long lasting, even in Australia’s famously tough climate. Perfect for businesses, especially large-scale projects, Vivid Mulch will add sophistication and intrigue to every garden. 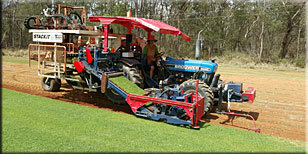 We can also help with spreading your mulch.